The company behind a business park redevelopment which has already created nearly 20 jobs has embarked on the next phase to build three new units. Allenby Commercial, Hull-based owners and developers of The Trade Yard Beverley, are aiming to complete the units by the autumn and offer up to 9,000 square feet of warehouse and workshop space with offices. Garness Jones, who are marketing the new site at Barmston Road, Beverley, are confident the development will attract occupiers of a similar calibre to those which have already moved into the first phase at Beverley and into The Trade Yard Scunthorpe, Allenby’s first venture under the new brand. The first phase of redevelopment at The Trade Yard in Beverley is now complete and fully occupied, with Screwfix taking the first unit and Topps Tiles opening in April. 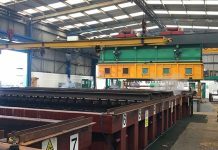 The Trade Yard Scunthorpe attracted Toolstation, which is further evidence of the ability of Allenby Commercial to build high quality space which meets the needs of these expanding national brands. The Trade Yard Beverley is also in a particularly good location for smaller operators, close to a lot of other businesses which are investing and expanding as the town benefits from much improved road links. Allenby Commercial launched The Trade Yard brand after acquiring the 7.24-acre Swinemoor Industrial Estate in 2015. Existing tenants included Bartoline, who occupy 28,000 square feet, and Derbybeech modular buildings with 62,000 square feet. The first phase saw the construction of two units of 5,000-square feet each. Screwfix opened last year, creating 14 jobs. Topps Tiles, which employs around 1,700 people in 355 stores, brought five new jobs when it opened in April this year as part of a nationwide expansion programme. Our strategy in buying the old Swinemoor Industrial Estate was to completely modernise a site which has historically been very successful for businesses in the region and which has an excellent location with high footfall. We have made great progress by securing Screwfix and Topps Tiles for the first two units and we are hoping for similar success with the three new units, which will provide space ranging from 3,000 square feet to 9,000 square feet. The new units are similar in style to the two which have already been completed and taken up. They will become available in the autumn and will be ready to occupy, in line with our standard commitment to providing turnkey solutions. They will have office space, storage space, parking and toilet and kitchen facilities and we expect strong interest from businesses already operating in our region and from others looking to establish a presence here.